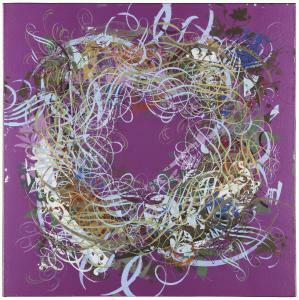 Find artworks, auction results, sale prices and pictures of Ryan Mcginness at auctions worldwide. 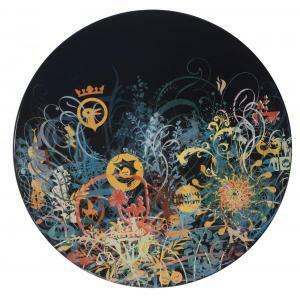 RYAN MCGINNESS (B. 1972) Surface & Symbol signed, titled, numbered and dated '"Surface & Symbol" Ryan Mc Ginness 2008 2/10' (on the reverse) porcelain-baked enamel on steel diameter: 24 in. (61 cm.) depth: 1 ⅜ in. (3.5 cm.) Executed in 2008. 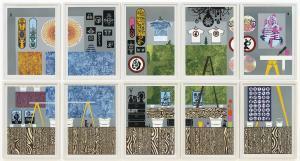 This work is number two from an edition of ten plus two artist's proofs. RYAN MCGINNESS (B. 1972) Rudy Ravioli signed and dated 'Ryan Mc Ginness 2004' (on the reverse) acrylic on canvas 36 x 36 in. (91.4 x 91.4 cm.) Painted in 2004. Provenance Deitch Projects, New York Acquired from the above by the present owner Literature J. Deitch et. al., Installationview: Ryan Mc Ginness, New York, 2005, p. 150 (illustrated in color). Please note this lot is the property of a private individual. 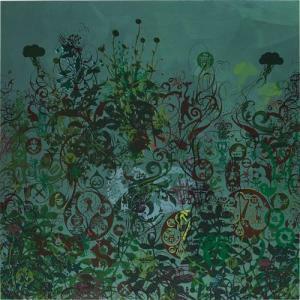 Description: RYAN MCGINNESS - Another Forrest Dimensions: 122 x 122 cm (48 x 48 in.) Medium: acrylic and silkscreen on panel Literature: Ryan Mc Ginness, No Sin No Future, Hong Kong, 2008, n.p. (illustrated) Provenance: Vous Etes Ici, Amsterdam Acquired from the above by the present owner Notes: Executed in 2006.